Well, this is what I got up to today! I had two remnants of fleece I had picked up on my travels with doggy footprints on them. I considered making an outfit for little Bear, one of my Pomeranians, but dd begged me not to embarrass the dog that way. So, what I did instead was to sketch up a nice size dog bone and use up the fabric making these dog toys. As you can see, my little remnants which totalled under .75 of a meter altogether yielded a nice pile of doggy treats. These will go to Heaven Can Wait, a local animal shelter that does not euthanize their "unadoptable" dogs and cats. If they are not adopted, they stay and live out their lives in the homelike surroundings of the shelter. Once I had cut out all the dog bones I could from the fabric, I used the scraps to make some cat toys as well. These are modelled after one the kittens were given in their "new kitty kit" from the vet. These will go along to Heaven Can Wait as well and hopefully they will give some fun and comfort to some animals waiting to find their "forever home". I have a reputation in my house of having a "black thumb", that is that I can't keep a houseplant alive to save my life. In my single days my house was a jungle of healthy plants so I think all the blame can't be mine. I am happy to be able to say that the handful of plants I have now do seem to survive and even thrive. This is my pride and joy - the lipstick plant I keep in my bedroom safe from the cat's abuse. Once or twice a year it decides to bloom and makes me very happy. You can see here from the appearance of the blossoms how it gets its name. Look who has arrived in my house to live! Over the holidays I was too busy to concentrate on getting much accomplished and I found myself spending what spare time I did have doing pretty mindless stuff. One of the ways I occupied myself was surfing around entering giveaways on the various blogs I follow. I was delighted to win this sock doll, Pinky, from Karen at The Selvage Blog. Karen's is one of my favourite blogs because I am always fascinated at the collection of unique items created from fabric selvages. I have made a couple potholders myself from selvages that have been featured on her blog. I would love to make a larger selvage project but I need to do a lot more sewing in order to collect enough selvages. As you can see, Pinky made friends pretty quickly after arriving at my house. She and Seven, the calico tabby, are obviously quite fascinated with each other. Never fear though - Pinky is much too adorable to become a cat toy. She is mine! lol At least for now, that is - she may find a better home eventually. I also won another giveaway prize - this beautiful handmade baby quilt from Rachel of Rachel's Quilts. I wish the photo did it justice so you could see how lovely and cuddly it is. Since I don't have any babies anticipated in the family in the near future, I forced myself to part with it and took it to the Hospital Auxiliary gift shop at the local hospital and donated it for them to sell in their shop. These ladies get an amazing amount accomplished for the hospital, raising money and then saving it until they can purchase items that the hospital needs that aren't necessarily in the budget. I was delighted to see the new leader of the auxiliary at the gift shop and realize it was an old friend, Elsie. I will be turning up at their meeting next week to join and see what I can accomplish in a more organized way. Instead of just donating the odd item I will be able to work with them to achieve their goals. I'm really looking forward to it! I've been pretty good about not posting lots of puppy pictures but with the way Dexter, the little guy, is growing I think I better post some or he won't be a puppy anymore. These guys gain about five pounds a week when they are puppies and it's hard to believe he went from being an armful of love just before Christmas to being pretty hard to pick up and carry around. It went so quickly! Duke and Dexter became fast friends almost immediately and they are pretty well joined at the hip now. Duke seems to be reliving his own puppyhood through Dexter and toys that bored him before are now exciting again. Poor little Bear isn't in the fun and games much now - the bloodhounds play a little too roughly for a little pomeranian! That doesn't stop her sneaking up and stealing all the toys though and running away with them! Dexter is so proud of himself that he finally attained his goal of getting up into my chair. After how hard he worked at it none of us had the heart to put him down. This is now his favourite place to nap. I've made these six 6 inch blocks for the Tea Time 2 DYB Round Robin I am in at CQI. They will hopefully reach their destination before the end of the week so that Lorrie can start working her magic on one. I really have to push myself to get piecing done - my heart is in the embellishment, not the piecing. Although these blocks don't relate to the tea time theme in any way, I'm sure they will by the time they come home to me. 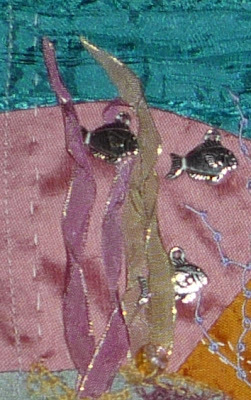 Here is the block I embellished for Beryl in the Under the Sea DYB Round Robin we are in together at CQI. I love the underwater theme so had a lot of fun with this block. I had this lovely varigated ribbgon with the gold edge and thought it would make great seaweed twisted and couched down loosely. There are three fish charms hiding amongst this growth. I couldn`t resist adding one of Nicki Lee`s pieces of hand dyed lace, in this case a lovely yellow/green starfish. 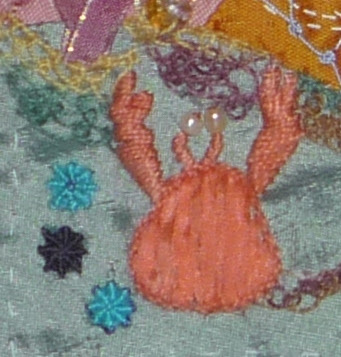 There is a piece of tatting just above that and between the crab and the starfish there are pieces of netting made with Detached Buttonhole Stitch and Netting Stitch. I added several larger beads that reminded me of the old glass fishing floats. I used some novelty yarn in blue/purple blend and couched it down to make some more seaweed. If you look carefully you can see a purple glass fish bead hiding there. I built some more seaweed with Feather Stitch, String of Pearls Stitch, and Maidenhair Stitch. I loved working on this block and I hope Beryl will like it. I live in a fairly dry area - our average annual snowfall is only 135.4 cm here - that is the equivalent of 53.3 inches which isn't really all that much. Well, I think we have had all of that land in the last week or so, and with the high winds that came with it we have quite a few drifts as well. Usually, our roads stay clear and the driving is good but this month is an exception. This weather has really come as a bit of a shock to the system. The cold we are used to here but, because we are fairly arid, this amount of moisture is unusual. It is sad that we are seeing the effects of climate change all over and yet we are still doing next to nothing to control carbon emissions. Well, I have decided why I don't know many organized people - I think they die off before they get to be my age! This organizational challenge is killing me! I managed to meet the challenges for days 1. 2 and 3. Yes, my computer desk, my junk drawer and my drawer under the stove (in lieu of a tupperware cupboard) are done and they are indeed things of beauty. all the way in - not just what you can see from the door! Now, today is the dresser drawers.... does this mean everyone`s or just mine? Do I get bonus points because I have been stuffing Christmas into boxes all day long in a very organized, labelled way? I don't think I'm going to be able to meet this challenge unless I get myself a major cheerleading squad! Any takers? To heck with it, I'm taking my stitching over to watch an old John Wayne movie (yes, Virginia, this True Grit that came out at Christmas is a remake), and maybe even pour myself a g & t, or better yet, get someone else to pour one for me! I have spent the last two days running back and forth to the city and town for meetings and errands so I've fallen behind on my stitching and my organizing. Hopefully I will have a few days at home now to catch up. So, I picked another sore spot - the drawer under my stove where I keep my pots and pans. Anything that close to the oven and that near the floor is a grunge magnet so it was long overdue for a good clean and redo. And here it is after a good scrub, the application of some vinyl liner and a bit of reorganizing. A few frying pans holding bravely onto their last few shreds of teflon as well as some rusty cake pans bit the dust so there is more room now to keep the ones I actually use. Much better - now to catch up on the last couple days I've missed! I'll also get some stitching done tomorrow to share - all this cleaning is getting a bit dull! The second day of the organizing challenge at A Bowlful of Lemons totally floored me - the assignment was to clean your computer desk! As you can see from the very embarrassing photo above, my desk is one of my prime nesting areas where my hoarding instincts totally come to the forefront. Definitely not a picture of organization! As if you needed to know more about what a mess it was, here is the side view. Even worse! Well, two days later, here is the result. Even Nala has a nice clean blankie underneath the desk where she likes to doze. I was not able to get it down to the totally clear desk I aspired to because there is too much here I need to use on a regular basis. The box under the wooden desk is not a cheat - it is my box of mailing supplies: large brown envelopes, bubble wrap, etc. The plastic tub peeking out from under the other desk contains the items currently waiting to be listed on Ebay. MMXI - New Years & New Starts!